By Fontenoy, Paul & Tucker, Spencer A. From the steam-powered models introduced in World War I to today's nuclear-powered, multiweaponed technological wonders, submarines have revolutionized warfare on the world's seas. This volume follows the extraordinary development of this key component of the world's navies. Seemingly invisible submarines have exerted enormous influence on naval warfare since the early 1900s. Today, they are a mainstay of world navies large and small, an economically efficient weapon system whose threat no fleet commander can ignore - and whose presence has sparked a continuing evolution in naval defenses and tactics. "Submarines: An Illustrated History of Their Impact" reveals how underwater warships evolved to become major threats to battle fleets and merchant shipping, as well as primary platforms for deterrent forces and crucial symbols of military power. 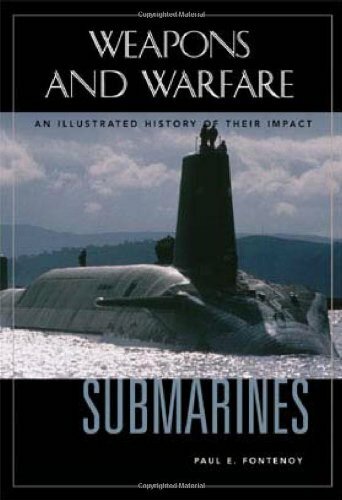 In a series of chronological chapters, "Submarines" describes key developments in diving ability, underwater endurance, and weapons capabilities in specific periods, while highlighting strategic and operational innovations; the role of technological research; famous submarine events, battles, and commanders; and the impact of submarine services on naval society. The book also includes an illustrated reference section covering every submarine class worldwide since 1900. This coverage plus additional reference features make Submarines an essential introduction to a weapons system that has long held the public's imagination.